Gray’s Anatomy for Students has been one of the most rated and wanted books when it comes to the subject of human anatomy. It offers a tightly-focused, comprehensive and well-versed text on the ever-evolving anatomical science education. It’s user-friendliness and easy-to-understand content is what makes this book so much popular among the medical students. Today, in this article, we are going to share with you Gray’s Anatomy for Students 3rd Edition PDF for free downloading (using our own trusted repository links). We hope that our readers will find this article useful in their quest for excelling in the study of human anatomy. Gray’s Anatomy for Students 3rd Edition builds on the previous edition of the book with significant improvements in the already existing effective content. 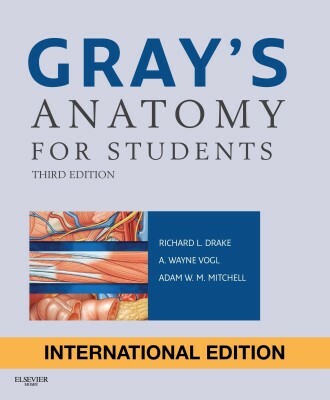 The 3rd edition of Gray’s Anatomy for Students now offers a more clinically-oriented and patient-centered text to the students. The authors and content developers have made a lot of changes to the book layout and have added a great deal of new clinical content. “In the clinic” and clinical cases/scenarios have been updated with new and more high-yield clinical content to help students prepare for successful patient encounters in the future. More than 1000 full-color illustrations of anatomical structures by renowned medical illustrators such as Richard Tibbits and Paul Richardson. These visually appealing illustrations make studying anatomy much more productive and leveraging. The 3rd Edition of Gray’s Anatomy for Students is now more focused on the practical application of the anatomical knowledge by means of features i.e clinical case studies, correlative diagnostic images and revised “in the clinic” boxes. The online Student Consult now offers additional features which mainly include access to the entire book online, self-assessment tests, anatomy quizzes, medical & physical therapy clinical cases and much more.